Four Nuer porters with Thesiger posed sitting on a buffalo he shot. The poor framing suggests that the image was taken by Idris Daud, Thesiger's Zaghawi servant. Morton, Chris. 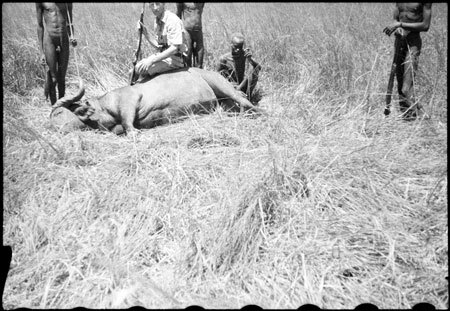 "Thesiger with shot buffalo" Southern Sudan Project (in development). 03 Jan. 2006. Pitt Rivers Museum. <http://southernsudan.prm.ox.ac.uk/details/2004.130.36564.1/>.